Not only did the Dodgers feature the first African-American position player to play in the Majors, but they also introduced the first African-American pitcher to enter a Major League game. 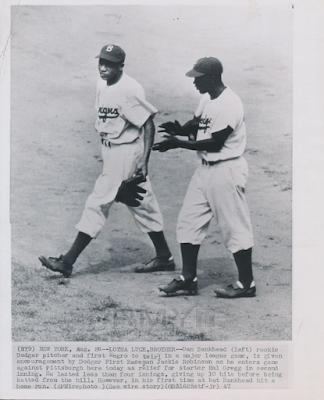 Featured above is a vintage AP Wire Photo, currently available for sale at RMY Auctions (Link Here), that shows a clapping Jackie Robinson (on the right) providing on-field encouragement to trailblazing pitcher Dan Bankhead as he enters a MLB game for the first time. It is dated to August 26, 1947. This Day in Dodgers History: In 2013 the Dodgers signed free agent reliever Brian Wilson. Happy Birthday, Tom Lovett, Ryan Theriot & Yasiel Puig! David Hood at True Blue LA shares his list of, "Dodgers 2017 top prospects: Nos. 21-25." Postseason shares announced. #Dodgers issued 65 full shares at $123,741.24 each. Also 8.285 partial shares and 20 cash awards.
. @ithrow88 has been named #Dbacks Pitching Strategist. Will work with the front office, coaching staff, and analytics department. Via Dave Cameron at FanGraphs; "Rich Hill Is Just a Different Kind of Risk." Yes, Rich Hill is about as high-risk as a player gets. But rather than focus on the fact that the Dodgers aren’t going to get 200 innings out of him, or that they can’t really be sure that he’ll be able to pitch for them in October again, Hill is a great object lesson in the balance of risk and reward. Last year, after just four great starts, the market only was willing to pay $6 million for Hill’s upside, but after 20 more outings at an elite level, MLB teams are up to around $50 million, because last year, Hill gave teams plenty more reasons to believe that, when healthy, he’s one of the best pitchers in the game. The performance risk has gone down quite a bit from a year ago, and so the price has gone up a lot. The health and age risks remain very high, and of course, there’s still performance risk here. But at around $50 million, you’re not buying sure things in MLB anymore. And there aren’t very many other guys in this price tier that offer the kind of upside potential Hill brings. Via Ken Gurnick at MLB.com; "Roberts says Maeda aims to increase strength, stamina: Dodgers manager updates status of team on Day 2 of Meetings." "That's one of the things this winter, we talked to Kenta, and he had an outstanding first year," said Roberts. "But it was more about understanding the toll that it took on him and his body, and to build some mass and to put on some weight to be able to handle the workload. "So as he was open to the different -- to giving them extra days in between certain starts, the extra time. I'd like to think that we can kind of do a little bit less going forward, as he's already kind of made that jump into Major League Baseball." Stealing Home at All Trade Bait, All the Time shares some "Cool Custom Baseball Art" by Gypsy Oak. Giovanni Balistreri at When Topps Had Base-Balls shares his newest, "FANTASY 1972 MIA-MIA: DON DRYSDALE."